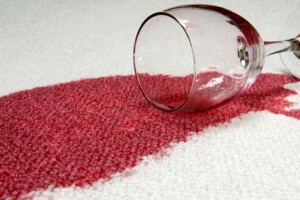 Have you always wondered how you are going to fix the damage that a red wine stain can cause? This isn’t an easy problem to fix, but it has to be done. I would hate for you to have to spend the money to have your carpet replaced. Well, their are some solutions that have been known to be effective on red wine stains. Your main priority is to blot and blot and blot!!!! Get up as much liquid as possible. Then you can use salt and it will bring up more of the red wine from the depth of the carpet. Blot some more! You can also use hydrogen peroxide and soap and then keep blotting. Always remember not to scrub because this will scrub in the stain deeper and you will need to call a carpet cleaner for a professional deep clean. Vinegar and soap is also a great combo after blotting. Then blot some more! Keep repeating this process until you get as much of the stain up as possible. If it’s still remaining than give us a call and we’ll get that rest of that stain out for good.